This short tutorial explains how to delete every other row in Excel by filtering or with VBA code. You will also learn how to remove every 3rd, 4th or any other Nth row. 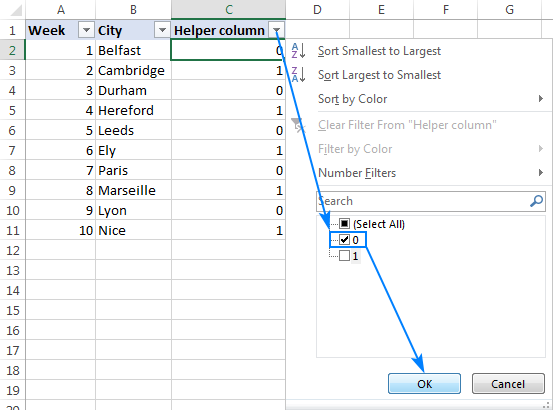 There are many situations when you may need to delete alternate rows in Excel worksheets. For example, you might want to keep data for even weeks (rows 2, 4, 6, 8, etc.) and move all odd weeks (rows 3, 5, 7 etc.) to some other sheet. 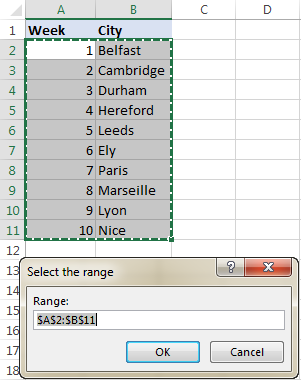 Generally, deleting every other row in Excel boils down to selecting alternate rows. Once the rows are selected, a single stroke on the Delete button is all it takes. Further on in this article, you will learn a few techniques to quickly select and delete every other or every Nth row in Excel. In an empty column next to your original data, enter a sequence of zeros and ones. 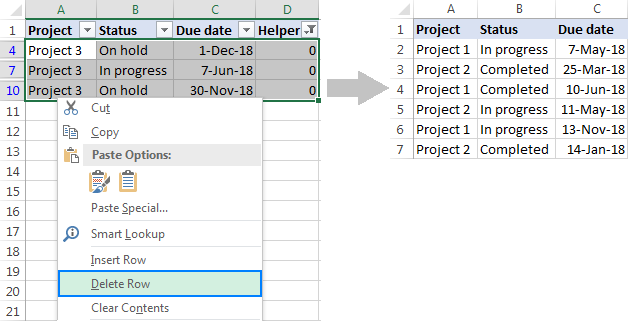 You can quickly do this by typing 0 in the first cell and 1 in the second cell, then copying the first two cells and pasting them down the column until the last cell with data. The formula's logic is very simple: the ROW function returns the current row number, the MOD function divides it by 2 and returns the remainder rounded to the integer. Depending on whether you want to delete even or odd rows, filter out ones or zeros. As the result, only the even weeks are left in our worksheet, the odd weeks are gone! Tip. If you'd like to move every other row to somewhere else rather than delete them altogether, first copy the filtered rows and paste them to a new location, and then delete the filtered rows. Press Alt + F11 to open the Visual Basic for Applications window. Press the F5 key to run the macro. If our data began in row 3, then m would equal 2 (row 3 minus 1), and so on. This correction is needed to sequentially number the rows, starting with the number 1. 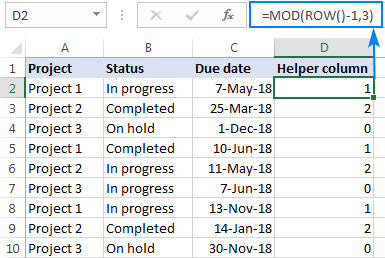 Filter the Helper column to show only "0" values. Select all of the visible "0" rows, right-click and choose Delete Row from the context menu. Remove the filter and delete the Helper column. 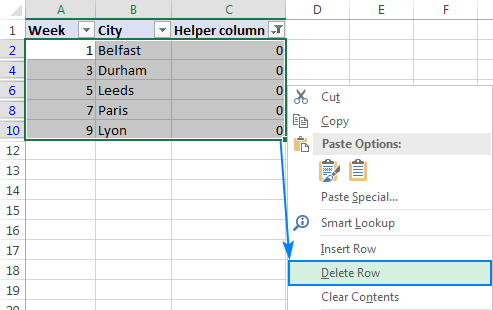 In a similar fashion, you can delete every 4th, 5th or any other Nth row in Excel. I thank you for reading and hope to see you on our blog again next week. 5 Responses to "How to delete every other row or every Nth row in Excel"
Very useful article, particularly 'How to delete alternate rows in Excel with VBA'. 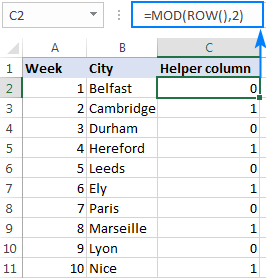 How do I add a form (and any additional code) that allows me to change the set 'alternate rows' to 'delete every Nth row or N Rows'. Other than going into the VBA editor For every new requirement. What I have in mind is say a button that on click calls a simple form that allows me to change the Nth Row or and N Rows parameters or confirm the last entered values. Press OK, Then Runs the dialog that prompt me to select a range. also 'How to delete alternate rows in Excel with VBA' might be better at the end of the Article so that all the 'filtering' non VBA subjects were together. I love you so much for this!! You literally saved me hours. Thanks for the precious information..
Will seek for other informations also. Thanks a lot. You really saved mytime.